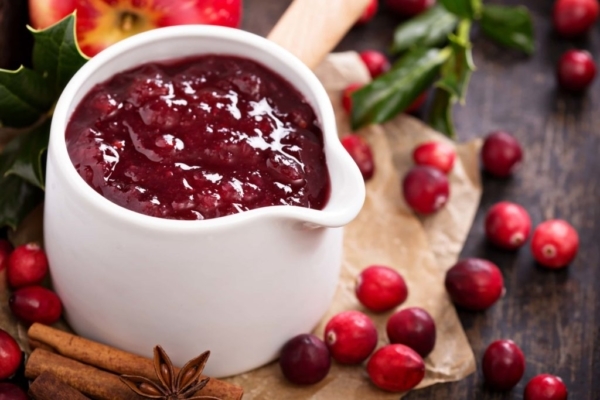 So how do I make cranberry sauce healthy? To sweeten the organic cranberries, I use coconut sugar. Coconut sugar is much better for your health because it doesn’t spike your blood sugar levels. Take a look. Doesn’t it look just like the real thing? And in my opinion, my cranberry sauce tastes better than traditional Thanksgiving. Add one cup of cranberries to a medium sized saucepan. Reserve ½ cup for later. Add the coconut sugar, water and lemon zest to the pan and cook over low heat for 10 minutes, stirring occasionally. Increase the heat to medium-high and cook until the cranberries burst, about 10 more minutes. Reduce the heat and stir in the remaining cranberries for texture. Stir occasionally for 10 minutes. Remove from heat and add sea salt. Refrigerate for 3 hours or overnight.